My last dinner get-together for 12, I wanted to keep things easy to eat as we would all be walking around with our food on strong paper plates. The menu definitely needed to feature things that did not need to be cut with a knife and the meat portion needed to pair well with recipe I was dying to make for my friends - Yam Pad Thai. After searching cookbooks and the internet, I decided on Asian Turkey Meatballs. There were lots of recipes out there to choose from, but one of my guests needed to avoid soy sauce. That made it important to find a recipe where there were lots of other flavor notes and very little soy sauce as I needed to be able to remove that ingredient from the recipe without affecting the taste too much. In the end I was drawn to a recipe from Skinnytaste. As always, there were a few changes made. Once combined, I found the meat mixture really soft. Perhaps my ground turkey had more water in it or was less lean, I do not know. I did a quick internet search on other recipes and it indicated I could double the panko crumbs so tried that. The mixture was still very soft, but better. I kept my hands buttered while rolling the meatballs to keep the mixture from sticking. I think there is a reason the mixture is kept wetter. Turkey is so lean it can be dry when cooked. It's a way to assure a moister cooked meatball. 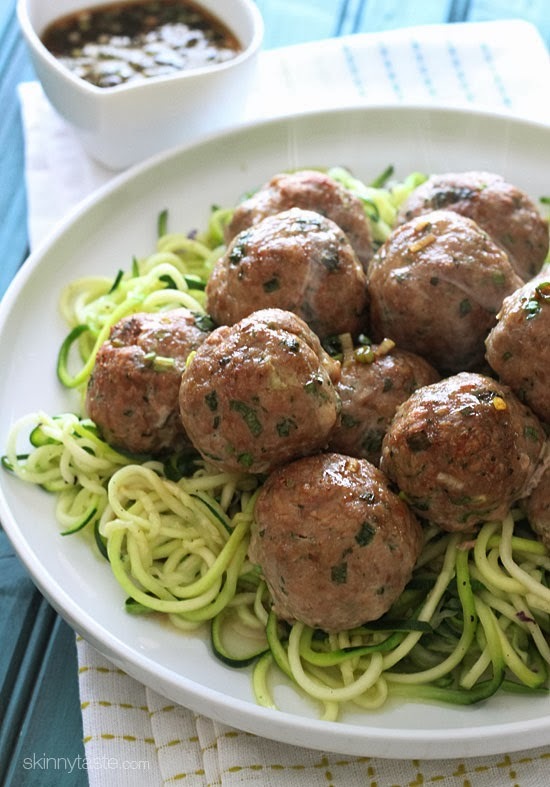 Skinnytaste uses 1/4 cup for each meatballs making them larger than normal. As this was for a party, I wanted a cocktail size, so rolled them accordingly. 500 degrees in my oven proved really hot so may experiment next time with taking this down just a tiny bit next time. Remember, every oven is different, so needing to make slight adjustments is very common. Just keep them small. Because of the soy sauce issue, I offered an array of other dipping sauces, but the meatballs were honestly really tasty on their own. I'm going to make this recipe again for my family as shown in the photo with the Lime Cilantro Dipping Sauce and served on the bed of Zucchini noodles. What a great low-carb meal! Preheat oven to 500°F. ( a bit high in my oven). In a large bowl combine the ground turkey, panko, egg, salt, scallions, garlic, ginger, cilantro, 1 tbsp of the soy sauce and 2 tsp sesame oil. Gently mix with your hands until combined well. Shape meatballs 1/4 cup in size and transfer to a baking sheet. Bake until cooked through and browned, about 15 to 18 minutes. Transfer the meatballs to a serving dish. Stir the sauce, then drizzle a little on the meatballs. Serve the meatballs with the remaining sauce on the side.